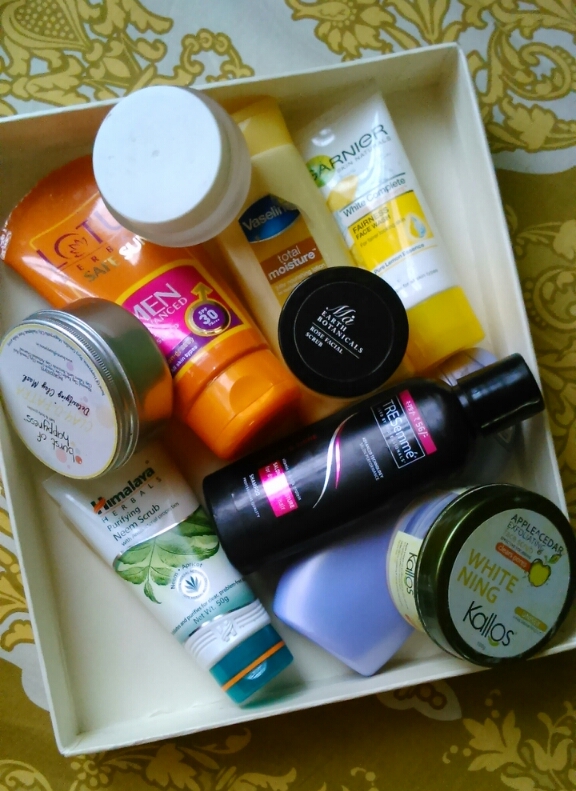 Empties post after a long time, so today am sharing some 3-4 months empties but very few will end up being a repurchase as some products are good but very few are more likeable. I love this body lotion a lot dye to it's thick texture and intense hydration effects. However I would not repurchase the same variant as I would like to try other variants as well as other brands. This scrub ended up majorly being used as a facepack and I could see a subtle glow on my face after using this as a scrub as well as a facepack. It is a bit highly priced but all ingredients used are organic and hence the price tag. Repurchase after some months as I already have Fuschia scrubs. A very good body scrub and exfoliant is what I concluded about this scrub. A great product with a great price and yes some parabens. But am impressed with the results of the scrub, however it is a skip for me as it has parabens as well as SLS. Himalaya Herbals neem scrub first broke me out, then I used it for some time as a body scrub and again used as a face scrub. I think my skin adjusted to the scrub :D as I didn't experience any breakouts further. It removes dead skin cells effectively but doesn't show any effects on black heads and white heads. I would skip it totally but it is highly recommended if you are Himalaya Herbals fan. Ugh, the fairness claims! this product is a total mess as it dries up my skin and also irritated my nose area. This is not an empty, some product is left in it. Not at all a repurchase. Amara Organix Body Butter is totally worth the price sans chemicals, but it would be majorly a summer body butter. It is very affordable at the same time. Not a repurchase as I am on an exploring spree. This is a total miss for me as it dries up my hair inspite of oiling. Currently am using Ethicare Remedies Fclin Shampoo and liking it. BOH Clay-o-patra facepack is truly makes your skin glow. It is blend of all the best clays but is very drying for my nose and chin area. Even after using rose water it dried my skin. I won't repurchase this as I like using Burst of Happyness What a girl wants cleanser as a facepack. I had received the goodies way back in December or January but eventually forgot to use it. I loved this rose water and felt the cooling, soothing, calming sensation. One of the best rose waters available. I liked using this shower gel due to its authentic rose fragrance however it is a bit pricey for the job it does. So not a repurchase. I loved this facewash to the core as it isn't drying at all and fairs well in its claims. Moreover it is budget friendly. However this variant is very hard to find, so whenever I will.spot this variant I will repurchase. He used this one religiously during the summers and still didn't find any results. He also stated that the matte effect leaves a patchy look and whenever he washes his hands the lotion just comes off, rather it doesn't get absorbed easily. He won't be repurchasing this one and is currently using the Ethicare Remedies UVmed sunscreen gel and likes it a lot. These are some products which I used religiously and emptied them.